Gene Black an Alabama Artist and Quilter: What?!?! The Middle Section:Pieced! How many of you have decided that I forgot all about the "Coins Quilt?" 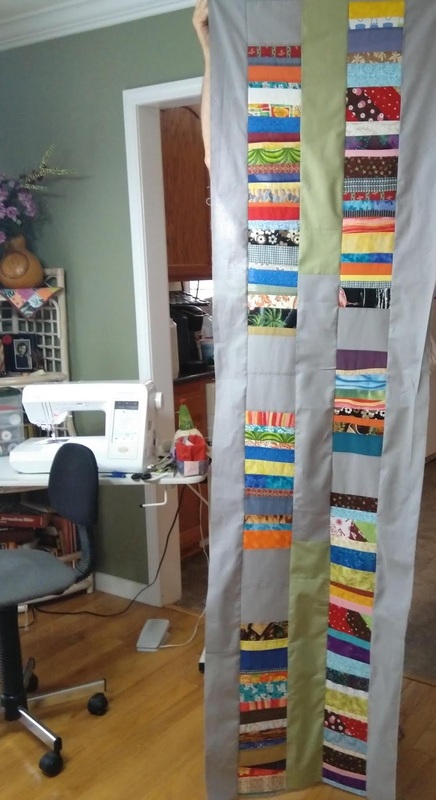 In that post, I said, "I will not be rushing through this quilt as I am slowing down a bit on sewing and weaving so I can work on TWO other things. " Ha ha. I am definitely not rushing on this one. That post was in July and it is now late September. 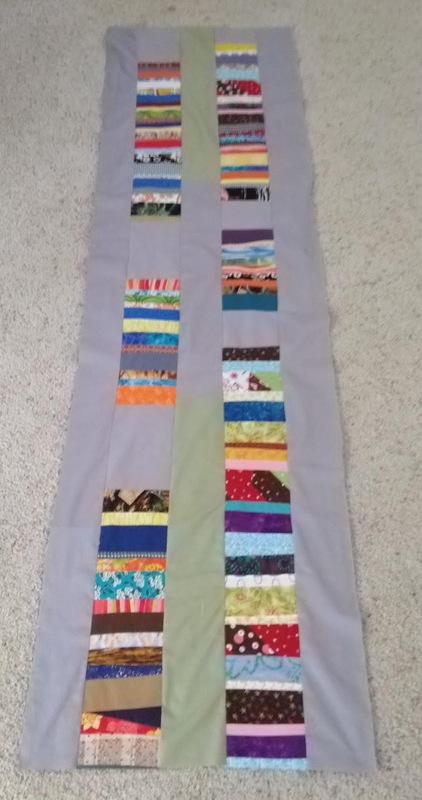 The first "third" of the quilt was completed and posted about - but since then lots of time has been taken up by the Spanish, ukulele and flexibility classes that I am taking. However, the second "third" of the quilt top is now sewn. My lovely rather precise layout has fallen by the wayside. If you are wondering, I am fine with that. In fact, it is a happy thing. Since the gray fabric was in short supply, the option to step back and be creative with the design was the perfect choice. Since that was a bit blurry, I had a friend hold it up and got a more direct shot of it. You can see my Babylock machine in the background. Another change that I realized I would need to make is in the strips I will join it with. The original plan was to use gray against the two gray strips on this piece. The problem that suddenly became clear to me is that the black borders would have two thin gray strips running through the top and bottom borders. Instead, I will use black joining strips that will connect the top and bottom borders on either side of this section. It will give a contrast pop to the design - at least that is the story I am telling and I am sticking to it. It looks like it is going to be a big one. I like big quilts! It is coming along nicely. It really doesn't seem like you have been working on it that long. I am enjoying the process. Looks really good. Gray is one of my favorite colors to work with in quilts!! Question? What program or thingy do you use to type in a note on your photos before posting? This inquiring mind would like to know....hehehe!! Your coins quilt is coming along. It looks like it is going to be a nice size.